#1: MINDstyle's plans for 2009 are grand. I spoke to MD, who runs MINDstyle, on the phone last night. He's in the midst of putting together a whole truckload of new releases for the 2009 toy season later this year. You can expect innovative, high quality toys as always! Most notably he is working on the Michael Lau Godfather vinyl toys project (link goes to P&P as MINDstyle has not added this project to their website yet!). That series is just going to go insane. Expect total madness from all corners of the globe. However, we shall not forget that MINDstyle also has Brandt Peters' Serv-o-Matic mini figure series coming up, which I personally am very excited about. 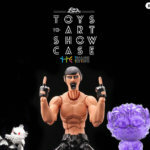 #2: tokidoki products: Strangeco has teamed up with the tokidoki brand to create a one-stop-shop for retailers (like us) who want to support the tokidoki brand! They are adding Snooze City's tokidoki pillowcases to their lineup, in addition to a range of tokidoki iPod and Mac Laptop skins! This goes along with the tokidoki toys in plush, vinyl & plastic that Strangeco manufactures, as well as tokidoki stickers, posters and skate decks. Expect a survey (with prizes! again!) from us soon to solicit your interest in all the different tokidoki products out there. We'll put the names of everyone who responds into a hat and pick some winners to give toys to! #3: Toy2R has a new US distribution channel which makes it easy and fast for us to get new Toy2R products, and there are a HUGE number of new Toy2R toys coming out in 2009! We have already had requests for some of the Kozik Potamus figures and a number of other Toy2R products. Keep those requests coming, we always like to hear what you want to get! In the short term, you may recall that last year as this new distributor was getting themselves set up, we ran a survey contest to ask you guys what Toy2R products you wanted, and we got a TON of replies which helped us place our first orders with them. Well, the distributor is about to receive another container of toys from Hong Kong and we will be able to fill a lot of those preorders soon. And our next exclusive will most likely be coming from Toy2R & David Horvath. Will post up more info on that as it is available.